Little gems of the sea, a.k.a. oysters are the perfect way to treat yourself this spring! If you’re a seafood lover and have never given them a try, it’s definitely worth splurging for the opportunity. The best way to describe their flavor is simply pure ocean in a shell. Try our smoked oyster’s recipe and serve them at the next get together or enjoy them yourself (because when it comes to oysters who really likes to share?). Scrub oysters in cold water. Shuck your oysters by prying the shells open to allow water to rinse inside the oyster. With the Flame Zone™ cover removed, adjust setpoint temperature to 450°F and preheat your MAK grill. Shape foil into the tray; place oysters onto a tray. 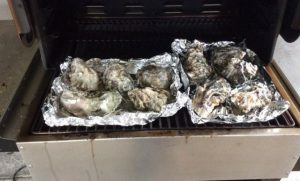 Place oysters on grates over Flame Zone™, close lid and cook until oyster shells pop open approximately 10-12 minutes. Carefully remove the tray from the grill. Place hot oysters on serving platter. Serve hot with melted butter and lemon wedges or cold with horseradish and hot sauce. * Recipe Option: Make an oyster roll or oyster burger by placing them on a bun with relish or other fillings of your choice.